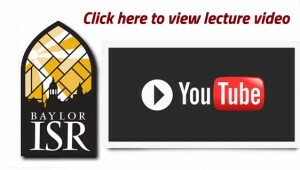 The Common Good – Does it Amount to a Political Programme? In an increasingly polarized and divided political environment, Christians have increasingly appealed to the ‘common good’ to develop a bipartisan approach to politics that retains crucial principles. But what does the ‘common good’ mean, and does it require that Christians pursue a definite and united political project? 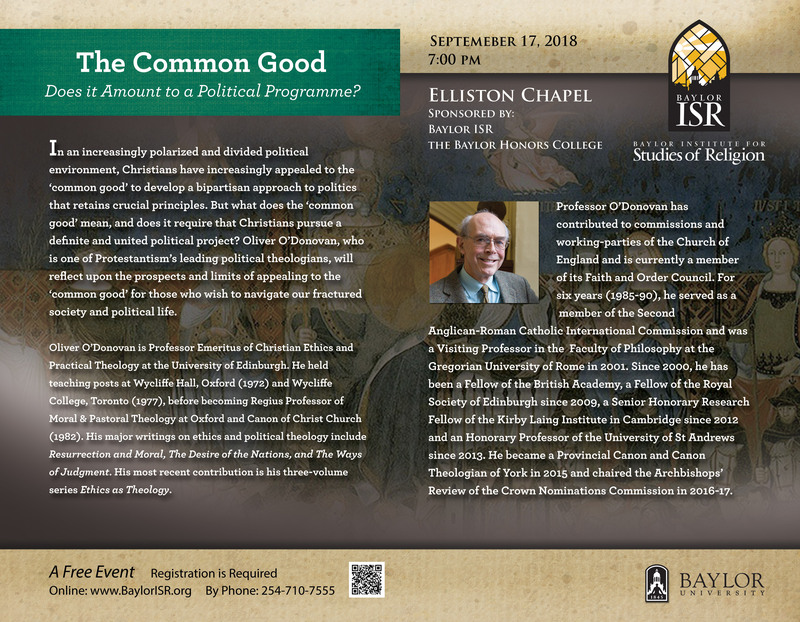 Oliver O’Donovan, who is one of Protestantism’s leading political theologians, will reflect upon the prospects and limits of appealing to the ‘common good’ for those who wish to navigate our fractured society and political life. 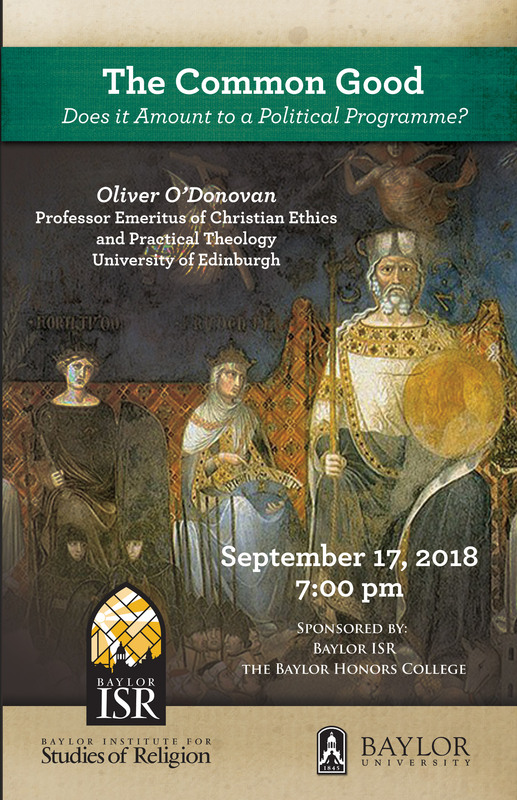 Oliver O’Donovan is Professor Emeritus of Christian Ethics and Practical Theology at the University of Edinburgh. He held teaching posts at Wycliffe Hall, Oxford (1972) and Wycliffe College, Toronto (1977), before becoming Regius Professor of Moral & Pastoral Theology at Oxford and Canon of Christ Church (1982). His major writings on ethics and political theology include Resurrection and Moral, The Desire of the Nations, and The Ways of Judgment. His most recent contribution is his three-volume series Ethics as Theology. Professor O’Donovan has contributed to commissions and working-parties of the Church of England and is currently a member of its Faith and Order Council. For six years (1985-90), he served as a member of the Second Anglican-Roman Catholic International Commission and was a Visiting Professor in the Faculty of Philosophy at the Gregorian University of Rome in 2001. Since 2000, he has been a Fellow of the British Academy, a Fellow of the Royal Society of Edinburgh since 2009, a Senior Honorary Research Fellow of the Kirby Laing Institute in Cambridge since 2012 and an Honorary Professor of the University of St Andrews since 2013. He became a Provincial Canon and Canon Theologian of York in 2015 and chaired the Archbishops’ Review of the Crown Nominations Commission in 2016-17.